McMaster’s business school campus in Burlington, the football stadium on the main campus, and the ongoing work of the McMaster Children and Youth University all have one thing in common. They were made possible by the generous support of one man and his family – Ron Joyce. Joyce passed away January 31 at the age of 88. The campaign surpassed its goal, raising $474 million for university research, teaching and student support. Joyce first became involved with McMaster more than 20 years ago. He supported student awards across a number of Faculties, created bursary funds and the Joyce Family Foundation became a major contributor to McMaster’s Children and Youth University that runs a series of public lectures for children from across the city. But he is perhaps best known for his $10 million gift that created the Ron Joyce Stadium and a $10 million gift to build the Ron Joyce Centre at the DeGroote School of Business in Burlington. Joyce was a Canadian business leader. He was a co-founder of Tim Hortons and was dedicated to the development and success of the Tim Hortons Foundation children’s camps. He also founded Jetport, a premium aviation service and Fox Harb’r golf resort in Nova Scotia. Among his many recognitions, he was named to the Canadian Business Hall of Fame and Burlington’s Entrepreneur Hall of Fame and received the Humanitarian Award from the Canadian Red Cross in Nova Scotia. He was a member of the Order of Canada and was the recipient of a number of honorary doctorate degrees including a Doctor of Laws bestowed by McMaster in 1998. McMaster’s business school campus in Burlington, the football stadium on the main campus, and the ongoing work of the McMaster Children and Youth University all have one thing in common. They were made possible by the generous support of one man and his family – Ron Joyce. Joyce passed away January 31 at the age of 88. 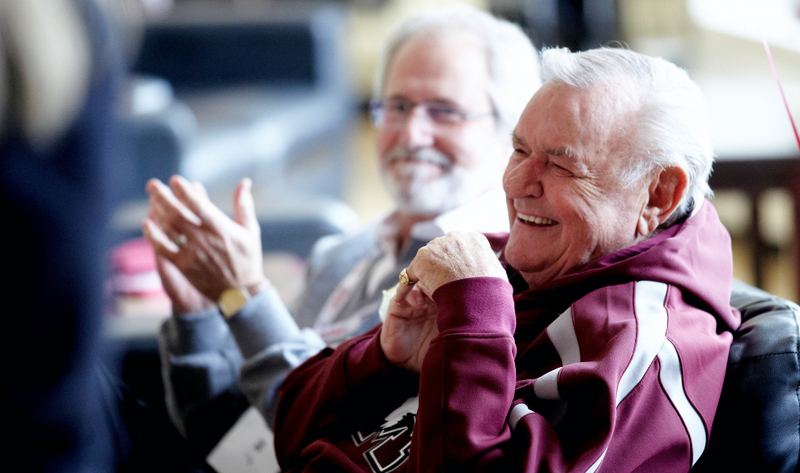 “We will not only remember him as an amazing philanthropist but as a truly dedicated volunteer and friend to McMaster University and to the Hamilton community,” said Mary Williams, vice-president, University Advancement. “I remember when Peter George and Roger Trull talked with him about chairing the <a href="https://dailynews.mcmaster.ca/articles/mcmaster-reaches-higher-with-new-fundraising-campaign/">Campaign for McMaster University</a> in 2006. He had never led a university campaign before but he agreed, helped to bring a great team together and tackled the challenge with amazing enthusiasm and commitment.” The campaign surpassed its goal, raising $474 million for university research, teaching and student support. “There was a unifying theme to what has been years of magnificent McMaster support from Mr. Joyce,” said McMaster president Patrick Deane. “He was most interested in making sure our students have the best experience the university could offer and helping children from all backgrounds benefit from the opportunity to learn and become a part of the university community. He was enthusiastic and committed to making a difference in so many ways and he will be greatly missed.” Joyce first became involved with McMaster more than 20 years ago. He supported student awards across a number of Faculties, created bursary funds and the Joyce Family Foundation became a major contributor to McMaster’s Children and Youth University that runs a series of public lectures for children from across the city. But he is perhaps best known for his $10 million gift that created the Ron Joyce Stadium and a $10 million gift to build the <a href="https://dailynews.mcmaster.ca/articles/ron-joyce-centre-officially-open/">Ron Joyce Centre at the DeGroote School of Business</a> in Burlington. At the <a href="https://dailynews.mcmaster.ca/articles/ron-joyce-donates-10-million-to-mcmaster-burlington-campus/">announcement of the Ron Joyce Centre</a> he said the project was important because, “It is going to create a distinctive presence for McMaster, and I know it will be a tremendous benefit to the Burlington community.” Joyce was a Canadian business leader. He was a co-founder of Tim Hortons and was dedicated to the development and success of the Tim Hortons Foundation children’s camps. He also founded Jetport, a premium aviation service and Fox Harb’r golf resort in Nova Scotia. Among his many recognitions, he was named to the Canadian Business Hall of Fame and Burlington’s Entrepreneur Hall of Fame and received the Humanitarian Award from the Canadian Red Cross in Nova Scotia. He was a member of the Order of Canada and was the recipient of a number of honorary doctorate degrees including a Doctor of Laws bestowed by McMaster in 1998. Women's Basketball: Marauders claim first national title with 70-58 win over Laval Rouge et Or. McMaster won its first Critelli Cup championship since 2008.